Before reading this article, you may want to read my previous article, which covers producing other text-shadow effects in IE. After you become familiar with the above two articles, implementing text-shadow in IE9 becomes a two-step process. (Note the data-innertext attribute in the element we want to add the text-shadow to. This must contain exactly the same text that the element itself contains. We’ll explain why we need this later on). As one would expect, works in Firefox but not in IE9. I set the color to be the color of the text-shadow. We set a background-color to be halfway between the color of the text (black) and the visual background of the text (white). In this case, I chose #ccccce since #cccccc is already being used by as the color of the text-shadow. We remove the background color with the Chroma Visual Filter (this is necessary to avoid the Blur filter from being pixelated, in the same manner as the text-shadows in my previous article). 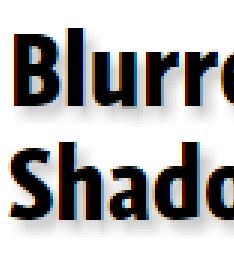 We apply the Blur Visual Filter to have a pixelradius of 3 (which is the same as the blur radius from the text-shadow. So now we have the shadow in IE! But what about the solid text on top? The :before rule duplicates the blurred text, colors it black and places it before the blurred text. The text is then duplicated because of the content property, which uses the value of the data-innertext attribute as the generated content — now you know why we set data-innertext at the beginning of this example. It is absolutely positioned, and since the top and left properties are not set, it places the text on top of the original text. Also note that the width is the same as the original element (in this case 230px). This is very important, otherwise the shadow will not appear below the text correctly. Why do we need to do this? 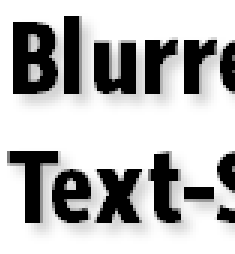 Because adding the Blur filter pushes the text a few pixels from down and to the right — namely, the same amount of pixels from the blur-radius. These simple formulas compensate for that, and place the shadows according to what you set for the x- and y-offsets. Note: the other browsers look about the same in Firefox, so I didn’t bother posting screen captures of them. See the above code in action, with IE9’s blurred text-shadow workaround. You cannot have more than one type of font, font-size, font-weight or font-style with the shadowed element. This is due to the way we produce the shadow (i.e. the data-innertext cannot contain any HTML elements to control the style). The shadowed element cannot be an inline element. It can be a block or an inline-block though. Any background colors or background-images that you want to appear in with the text-shadow must appear in an outside element. For example, in the following HTML, you would put the background-image or background-color on the <div> tag, not the <p> tag which would have the text-shadow. The shadowed element must be of fixed width (i.e. widths can be measured in px, em, etc. Percentages will not work). Think you can do better? I challenge you! I am almost certain there has to be a better way with fewer restrictions that the solution I give here. I also know there are quite a few smart people out there who read this blog, so I am dropping the gauntlet and challenging everyone reading this article to help come up with a better solution. Post a URL with an example below, and if I like what I see, I will post a follow up article to this one with what I believe are the best solutions. Here’s your chance to solve what I think is a huge web development problem and be recognized as Someone Really Clever™. It works in MSIE7~9, maybe. The document is written in Japanese, but you can check how it works visually. This looks great! My Japanese is not up to technical documents, but Google Translate looks like it does a really good job here: http://bit.ly/kGGI28. Thanks for sending this! Is this released under a free license? Just, please don’t remove the commented lines at the top (link to my web). @Ben: While this method may be easier in code, I have found in the past I have found the shadow filter a little bit “streaky” compared to the CSS3 implementation. However, others may find it useful or “good enough” for their purposes, so thanks for pointing it out. This increases the markup slightly compared to your solution, but gives better compatibility. As an added bonus, the text can also contain HTML. Here is a really great solution to the issue…. Thanks for the tutorial. I used it to come up with another solution. In the HTML I created a normal text element with a .shadow class, and styled it in the css. I then use JS if the browser is IE to parse through the page looking for all elements with class .shadow, and add testtest and remove the original text. Then using the CSS you provided I style it for IE. This way I feel is more SEO friendly and progressive enhanced. I didn’t realize your site strips the html out of comments. To clarify, I use JS if the browser is IE to add an element for the text and an element for the shadow, and use your CSS to create the blur and stack the 2 elements. This allows me to replace all text on the page with a shadow class to work in IE. gah… I’m not a fan of IE, but… There was a time like 10+ years ago, when IE was (in his own way) cooler than the rest, but due cross browser stuff, we couldn’t use “filter” to blur, bevel, gradients and such. Now everybody else does the cool things, and IE still does like 10 yrs ago. If you want my opinion, I’m mad cross-browser, this battle will never end! ROFL. Thanks for you post. It worked perfectly for me…after I saw the html included the data-innertext attribute. I was able to use a title attribute to achieve the same thing. Thanks again.